The 2014-15 Cleveland Cavaliers season will be the team’s 45th in the NBA (National Basketball Association). Last season, Cleveland finished third in the Central Division and was in the playoff hunt until the last weeks of the season ultimately finishing 10th in the Eastern Division. Of course, all of the hype for the 2014-15 NBA regular season will be the return of LeBron James instantly making the Cavs one of the favorites in the Eastern Division and to win the 2015 NBA Playoffs! 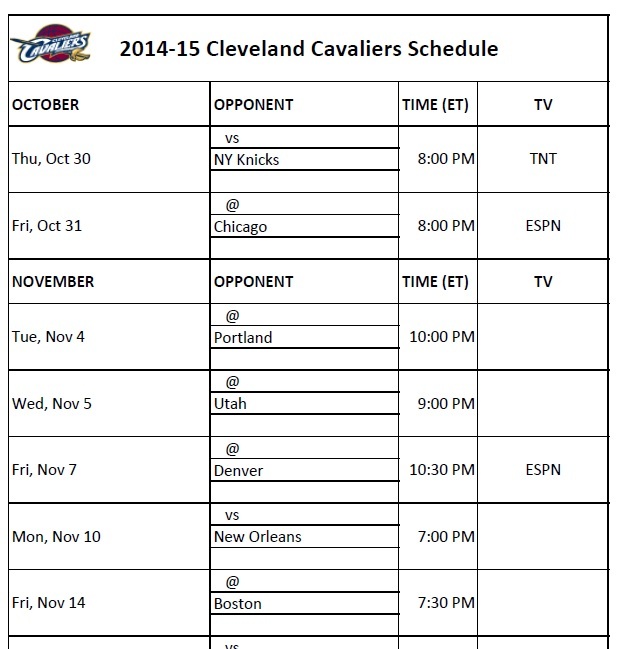 The printable 2014-15 Cleveland Cavaliers basketball schedule will be released soon and we will include it here for you. The following printable 2014-15 Cleveland Cavaliers schedule is provided for those who would like to print out the team’s schedule for the 2014-15 NBA regular season basketball schedule is released.